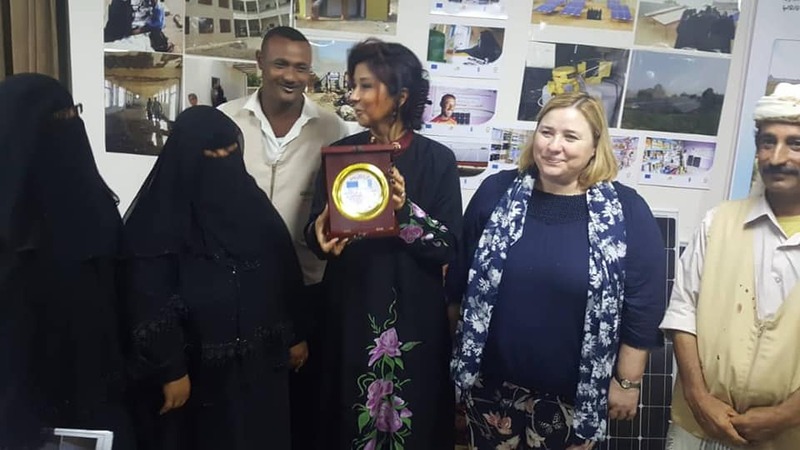 The visiting EU mission to our country and representatives of the United Nations Development Program (UNDP) toured the exhibition for small entrepreneurs and public service projects in Aden city. The SFD participated in the exhibition along with three international organizations whose activities are funded by the European Union through UNDP. In the SFD section, the delegation listened to an explanation from the members of the Village Cooperation Council (VCC) of Baitaria village, Lahej, on the sustainable services and development impact that the SFD Empowerment for Local Development program (Tamkeen) continues to entrench in the district by means of helping the communities build their VCCs, mobilize them to implement dozens of initiatives in times that the communities almost became dependent on aid and negative in dealing with all their surrounding affairs. The VCC members shared their VCC "success story" on the health center that the community initiated. They then honored the visiting guests and UNDP Yemen with a memorial shield, a brochure of Tamkeen achievements and an album containing pictures of all the VCC work in appreciation of the beneficiary communities to the donors' efforts to support the development of dozens of villages in Tuban.